blog.Habrador.com: Why are some games fun and other games boring? 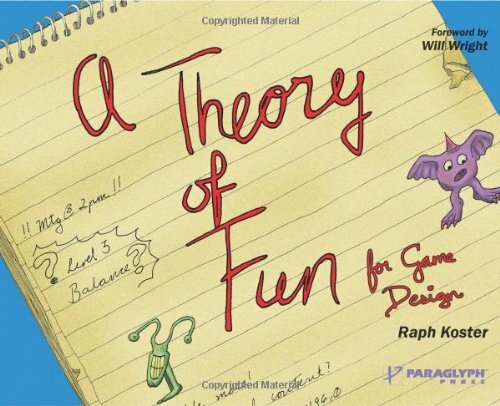 I've read the book A theory of fun for game design by Raph Koster. While the word game can include games like chess, the book has a focus on digital games, such as computer games, which the author also has worked with. Neither should you confuse game design with game theory, which is used in areas like in politics and economics, and is about how competitors make optimal choices. Compared with many other areas, such as math, the design of digital games is a relatively new area. I think I played my first computer game in like 1995 and it was also around that time when computer games started to become mainstream. So there isn't really a complete theory of how to make digital games interesting to play, but this book is trying to develop the basics of such a theory. I've already read another similar book called The art of game design by Jesse Schell. While the latter book has far more content, you can read "A theory of fun for game design" in a weekend. But I still think you should read both books. Game design is tricky to study because a game is a combination of many different areas. If you want to be a good game designer, you have to be an expert in cognitive psychology, computer science, environmental design, and storytelling - and that's just to name a few. To really understand why you think some games are fun and other games are boring, you need to see them from all these points of view. The basic idea the book is trying to give the reader is that we humans are still cavemen, and that's why we like to play games. Our primitive brain is consuming patterns, such as recognizing faces. The same thing is happening when we play games because a game consists of patterns we are trying to recognize. It's when we have recognized, or learned, a new pattern that we have fun. What's happening when we have have fun is that endorphin is released into our system, and this is always happening when we have learned something new or mastered a task in an environment where there's no pressure - not just when we play games. Why is this happening? The reason is that it's important for the survival of the human species that we learn, so our bodies reward us for it with moments of pleasure. So if you are making a game you have to make sure the player is always learning something. Some serious ill children in a hospital who played Nintendo required half as much pain medication as those who didn't. Television had no effect on the amount of medication required. According to doctors, playing Nintendo games has the power to alleviate pain for two reasons. First, the intensive interaction with video games requires a degree of concentration that acts as a diversion and distraction from pain - and everything else. Secondly, the highly excited state achieved during this interaction generates a steady flow of endorphin into the bloodstream. Endorphin is the naturally occurring proteins that mask pain and cause a sense of euphoria. Nintendo playing can cause a sort of high, but so can jogging. The player wants new puzzles. What's happening when you think a game is boring to play is that you have stopped learning something new, which is the same thing as saying that you know the answers to all puzzles in the game. The easiest way to add new puzzles is to add multiplayer, which is why chess is so popular. If you play chess against a physical person then each new game is a new puzzle to solve, so chess consists of an endless amount of puzzles. These puzzles should be different, but not too different. A new puzzle might force a whole new system on the brain, and often the brain doesn't like that because it doesn't like to do more work than it has to. You think this is exhausting, so you will stop playing the game. So the game designer shouldn't mix too many different types of puzzles. This is yet again why chess is popular. Each new game of chess is a new puzzle, but the difference between each new game of chess is not too different. The player has to understand the puzzles. You will not try to solve patterns and puzzles that appear as noise to you, instead you'll likely select problems you think you have a chance at solving. So if the you don't understand the puzzle, you will stop playing the game. The player must want to solve the puzzles. You and me like to learn different things and we have different experiences when we start playing the game. So everyone will not like your game, which is why you have to come up with puzzles your specific audience likes to solve. You will never be able to make a game for everyone. The puzzles you come up with should be puzzles that your audience has solved before. If we encounter a problem we've seen before, our first approach is to try the solution that has worked before, even if the circumstances aren't the same. We are lazy! Players like to run and shoot, which is actually teaching them to escape dangerous animals and hunt for food. 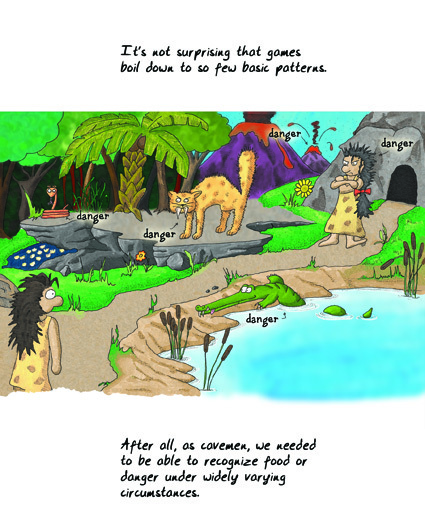 Players like to cheat, which is another cavemen skill. 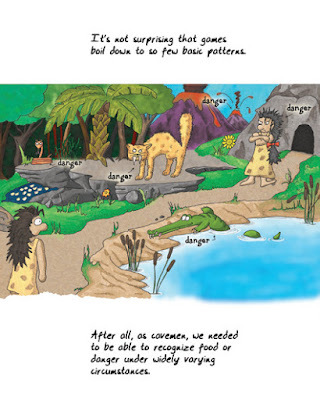 They didn't have any rules back in the old cavemen days, so the best cheater was the one who was most likely to survive. In a battle, tricking the enemy to attack the weak point when in fact it's the strong point is a cheat, but it's the winning strategy making the cavemen survive. A players who's playing the easiest level 200 times just to build up enough resources so the player can cruise through the rest of the game with little risk is the same as what the cavemen did when they stockpiled food to survive the winter. Players like realism even though they are not aware of it. If we see a character in the game, which has been modeled to look like a real person, we can tell if there's something wrong with the character. If the character is not 100 percent realistic, our primate brain thinks the character may be sick, so our primate brain is telling us to stay away from the character which is why we don't like it. This is why so many movies featuring animated "realistic" characters has failed. The same is true for physics. It has been shown that in games considered to have the "best controls" shared an important characteristic: When you hit the jump button, the character spent almost the same amount of time in the air. So the basic idea behind a digital game is easy. The book argues that to test if a game is fun to play, the best test is to play the game without any graphics, music, story, etc. If that's fun, then everything else will improve the game. Some game developers tend to add a story to a boring game, but we don't play games because of stories, so most players tend to skip the story or quit the game if the player can't skip the story. Graphics is important, but as we have seen with games like Minecraft, graphics is not what makes a game a fun game. Finally, the book argues that a game should provide the player insights into the player itself. If you don't want to read the book, or if you read the first version of the book, or if you are just bored, the author made a video presentation called A theory of fun 10 years later.